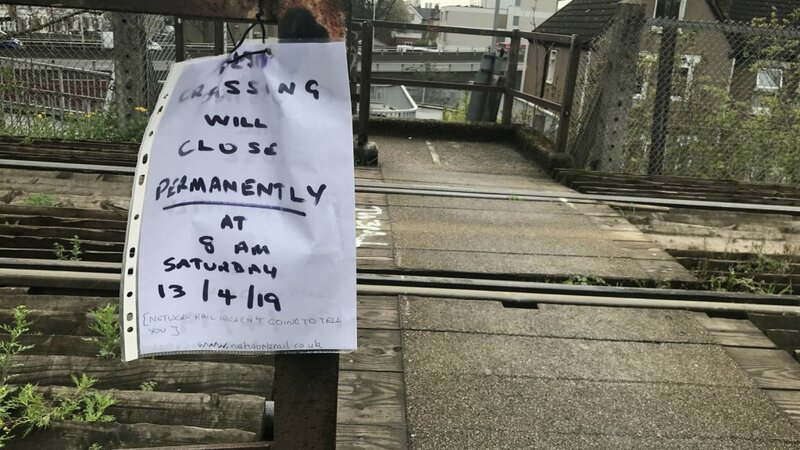 It seems the increased popularity of the Angerstein Wharf foot crossing in Charlton has caused some concern at Network Rail and they are seeking to close it. There is a new development has been built and this will mean many more wishing to use the crossing to gain access to Westcombe Park station – and this may have caused Network Rail to tout the crossing’s closure. However its only used by freight trains a couple of times a day at the most and some days there is no rail traffic at all – thus the proposed closure is a huge inconvenience. The crossing is considered a historic monument because it is the last of its kind with regards to London and it is unique because of its arrangement, the small tunnel through the houses etc, and the historic fact it was built in the 1850s by a local landowner (John Angerstein) for farm workers. 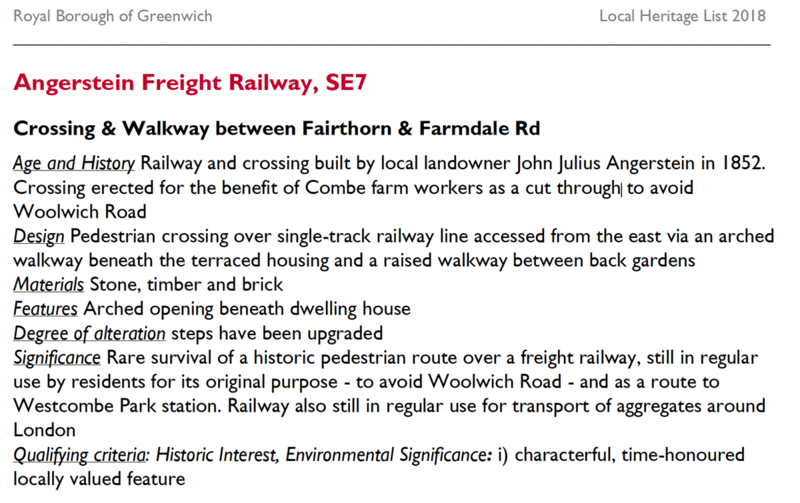 The other important aspect of the crossing is how it links to the footbridge across the very busy Blackwall tunnel road (the A102) and thence to Westcombe Park station. The crossing along with the footbridge provides a safe route for local residents completely separate from the area’s extremely busy roads. Local residents have received a letter (and it has also been placed on posts in the locality) which informs of Network Rail’s plans. A hastiily written notice has also been placed on the crossing warning it is to close with effect from this Saturday. The crossing is now considered ‘protected’ as it has been merited of local historic importance. There are also what one could call ‘Grandfather rights’ (or public rights, the right to use footpaths, etc) because the footpath has been in use for more than a hundred and fifty years. Rail traffic along here is at a crawl, perhaps in the order of 5mph. Because of the arrangement of the line (converging off a junction some distance to the south) and then its approaching the Angerstein Wharf depot means there is hardly any threat of anyone being mown down by a train! 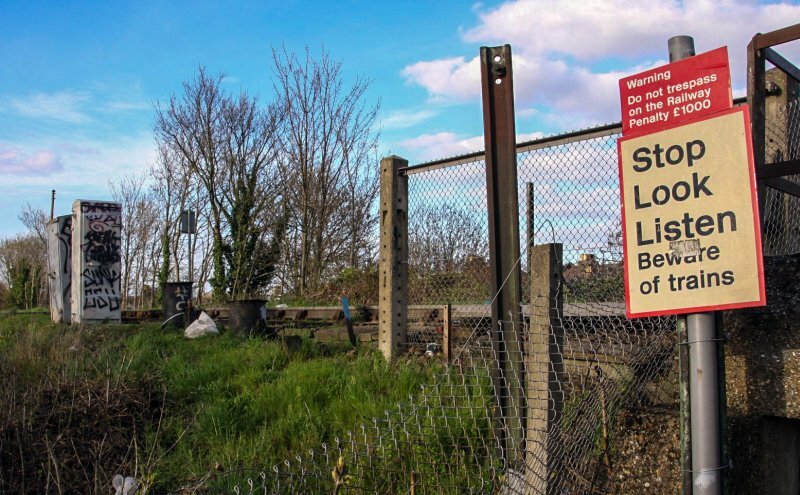 Residents are angry because it seems Network Rail is determined to close the crossing without consultation – it is a public right of way after all. Initially Network Rail were somewhat reluctant to comment on their plans but deeply intent on going ahead with the works to remove the crossing. This furore has been going on this past week as I noticed when Murky Depths first reported it. 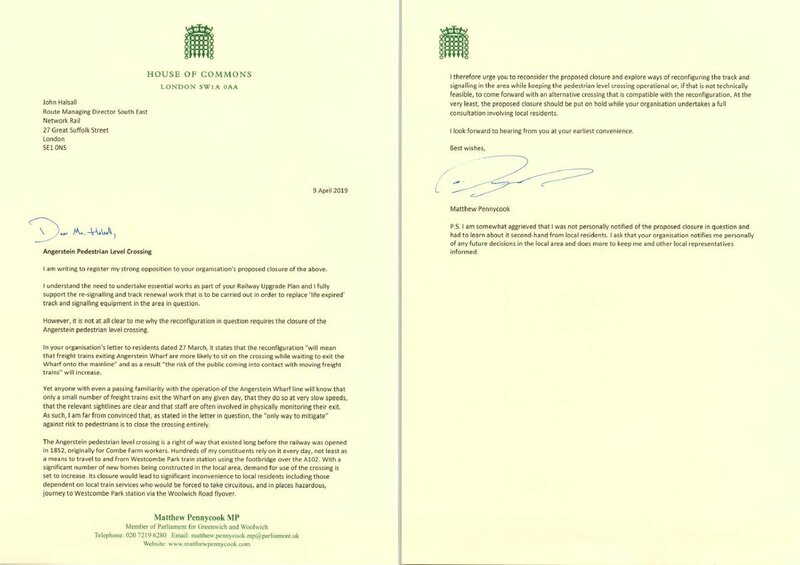 However as it stands today (Wednesday 10th April) there is a growing campaign against the closure, including threads on social media – and the local MP Matt Pennycook and Greenwich Council have both expressed their objections. Unusual rail crossing in London!